In June 1994, I made my first insect collecting trip to Big Bend National Park. Both of my previous visits to Texas had been to the Lower Rio Grande Valley, so I was anxious to see what beetle treasures awaited me in this huge chunk of western Texas. For three days I sampled the astounding diversity of beetles found in the park’s low desert scrub, oak/juniper woodlands, and high pine forests, and on the final day I decided to visit the sotol grasslands – a transitional habitat between the desert and woodlands in the Chisos Mountains foothills. Sotol (Dasylirion wheeleri) is the host plant of jewel beetles in the genus Thrincopyge – exquisitely beautiful beetles of metallic blue or green and vivid yellow. Larvae bore through the plant’s dried flower stalks, while adults wedge themselves in the base of this agave-like plant, hidden from view by the plant’s long, strap-like, saw-toothed leaves. I had not yet seen these beetles for myself, so I began searching the through the plants – carefully prying apart the wicked leaves in hopes of seeing adults peering up from the base, and then using my foot-long forceps to extract them. It’s a painful process, as no amount of care completely prevents the plant’s stout, recurved spines from impaling and ripping forearm flesh while trying to grab and pull out the beetles! While prying apart the leaves of one particular plant, I was startled by one of the most imposing-looking insects that I have ever seen as it jumped up on top of the foliage and assumed this decidedly aggressive posture. Although I recognized it as some type of katydid, it was unlike any I’d seen before – large and robust, vivid green and yellow with flashing red eyes, its short spotted hind wings outstretched, spiny forelegs held high, and huge jaws spread wide open. Her long dagger-like ovipositor only added to her impressiveness. So spectacularly terrifying was its threat display that I couldn’t resist the opportunity to collect it for eventual mounting in life-like position. I felt a little silly being scared of a katydid but nevertheless took great care to avoid getting my fingers anywhere near those jaws as I gingerly corraled it into a jar. Neobarrettia spinosa is also known as the greater arid-land katydid or spiny bush katydid, but I prefer the name that has been coined by some – “red-eyed devil”! This species belongs to a small genus of primitive katydids largely restricted to northern Mexico, with only two species extending north into the south-central and southwestern U.S. The black front edge of the pronotum and (in life) red eyes identify this individual as N. spinosa (N. victoria, also occurring in Texas, has the pronotal front edge green and the eyes pale). Unlike most katydids, which have adopted omnivorous or hervivorous feeding habits, species of Neobarrettia and their subfamilial relatives are pure carnivores capable of capturing and consuming prey as large as themselves. Its bulging eyes, elongate and heavily spined forelegs, and massively robust mandibles on a large head (presumably for enlarged mandibular musculature) clearly represent adaptations for predation (Cohn 1965). The painting above from Cohn’s revision of the genus shows the true colors of a living female and its threat display. I collected this specimen before the days of the internet or my own interest in photography, so I had nothing but my memory to guide me as I tried to recreate the threat display during mounting. I got it mostly right but missed on a few details – the wings should have been placed more vertically, and the insect also rears back more on its hind legs to display the brightly colored cephalic portion of its abdominal venter. I could try to relax and remount the specimen, but given its fragility and the fact that doing so would do little to make it any more imposing, I think the pose I have it in now is just fine. This turned out to be a more difficult ID Challenge than I anticipated, but a record number of participants played along anyway. Dave wins this challenge with 11 pts on the basis of a correct identification and entertaining logic to accompany it. Ben Coulter was the only other person to correctly identify the genus and species, earning 9 pts for 2nd place, while BitB’s own James Trager and TGIQ share the final podium spot with 5 pts each. Ben continues to dominate the overall competition with 32 pts now, but the battle for 2nd place has really heated up – Janet Creamer (14 pts) and TGIQ (13 pts) have the edge, but Dave (11 pts), James Trager (11 pts), and Christopher Taylor (10 pts) are all within easy striking distance. 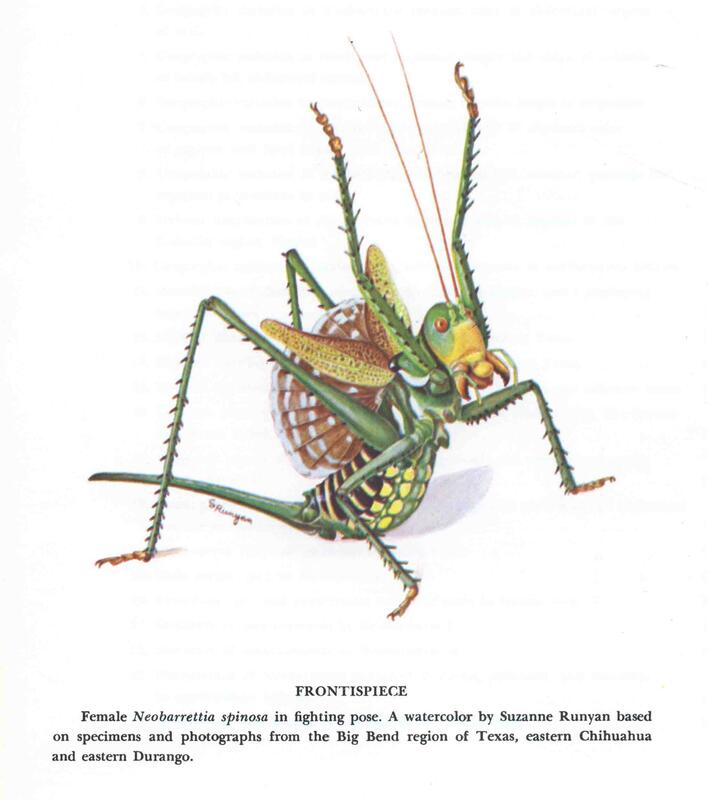 This entry was posted in Orthoptera, Tettigoniidae and tagged behavior, entomology, insects, katydids, nature, predator avoidance, science, Texas. Bookmark the permalink. Wow! What a stunning creature! 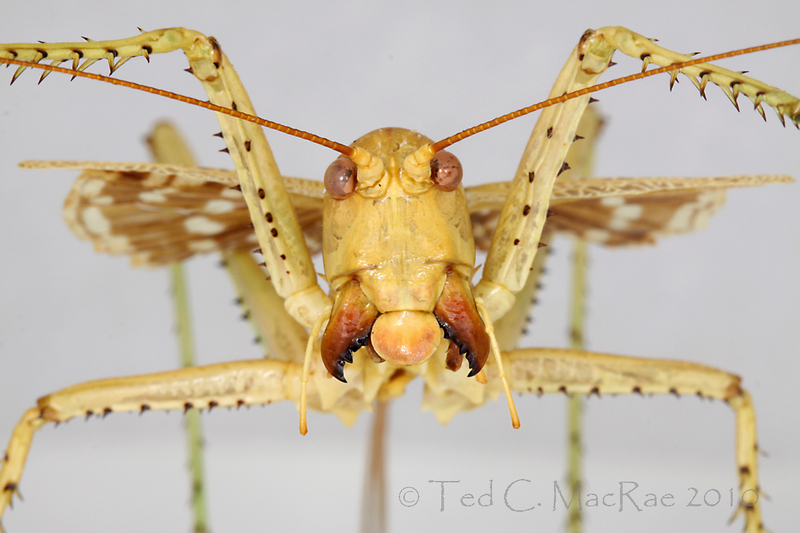 And a predatory Orthopteran…amazing! And an excellent mount as well..please stop me before I get interested in bug collecting myself! Now why would I want to stop you from doing that?! 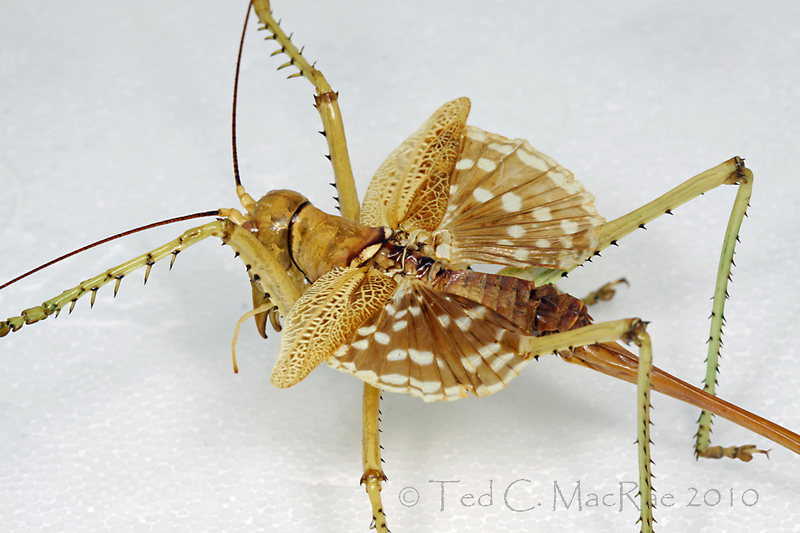 Yes, this is without question the most impressive orthopteran I’ve ever seen! They apparently are quite capable of bringing blood, so the threat display wasn’t entirely empty. errr…Ted? 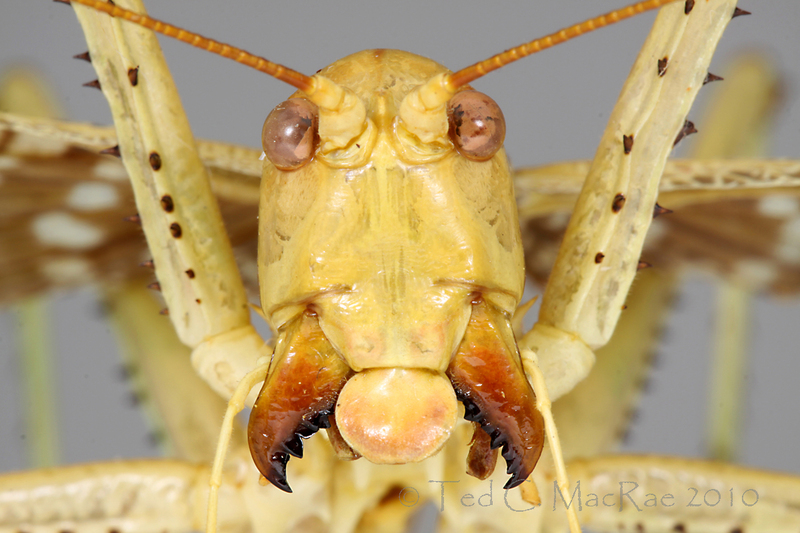 I forgot to mention that you have filed this Orthopteran under Coleoptera. Very, very satisfying, I must say, even if I did have to spend half the afternoon shoveling snow anyway. 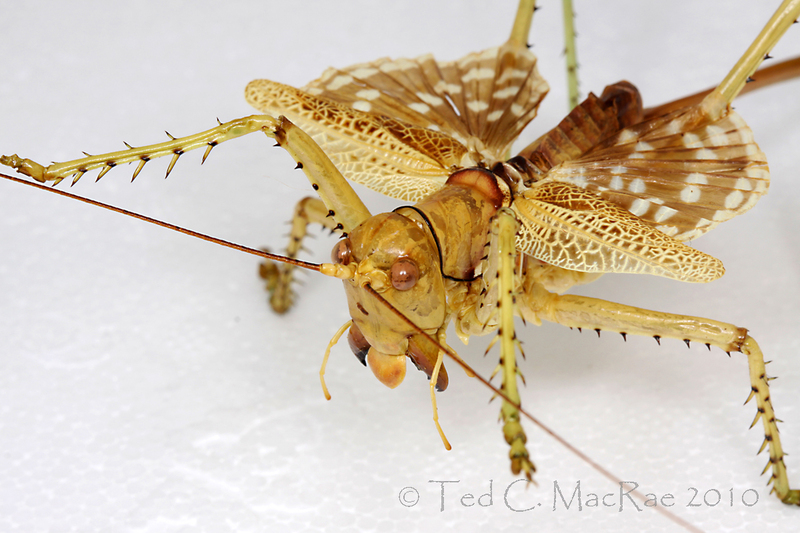 Of course, I had actually seen the katydid once and it had made a strong impression on me. So, I had an advantage (still, it could have been the other congener, so let’s credit luck). There are some even more impressive Australian katydids, but I couldn’t put a name on them. Re italics, knowing Ted is such a stickler, I did think I’d better, but the “You may use these HTML tags and attributes” in the post comment instructions does not include any italics. I thought I could try cutting and pasting an italicised entry from my blog, but was too lazy to try. Too late to matter, but let’s see if that works: Neobarrettia spinosa . I think a bigger peccadillo (ouch!) is failing to look up the author and, less importantly, the year. Let me remedy that with Neobarrettia spinosa (Caudell, 1907*). One of the reasons that taxonomic papers receive such an abysmal ranking in ISI is that people never cite them when using the species name (imagine the number of citation classics if they did). The other reason is that they rarely cite the revisions used to identify the animals – sloppy ecology if you ask me. *Caudell AN. 1907. The Decticinae (a group of Orthoptera) of North America. Proc. U S. Nat. Mus. 32: 285-410. I would say having seen this before was a huge advantage – I can’t imagine it impressed you any less than it did me (and it’s now been 16 years). I’m not sure what tags show up in the HTML tags list you see, but I see both i and em, either of which can be used for italics. At any rate, italics use was rewarded in Super Crop Challenge #3, so the precedence was there. Incidentally, copying and pasting an italicized entry from your blog seems to work (if that’s easier). I made an early decision when I started this blog to avoid the use of authority name and year of publication. Not that I don’t support use (and am quite pedantic about proper formatting) of such in primary literature. I see this endeavor as a link between the science and an interested lay audience – that audience would be far less interested were I to insist on appending every scientific name with its authority. It is for the same reason that I make as much use of common names as possible in this forum, even though I completely eschew their use in my formal taxonomic papers. That said, in a tie-breaking situation I would likely be inclined to award a bonus point for including the authority or other taxonomic details. I’m totally with you on the need to cite revisions used to identify plants and animals – it’s not as much of a problem in the taxonomic literature, but I can’t tell you how many economic and ecologic papers I’ve seen where there is no mention of how the identity of organisms discussed were determined or confirmed. Caudell AN. 1907. The Decticinae (a group of Orthoptera) of North America. Proceedings of the U.S. National Museum 32: 285-410. Wow, awesome katydid. The threat pose mount is great as it is for me. The menacing mandibles, raised front legs, spread wing – can’t ask for more! Love the first pic too! Thanks, Kurt – the U.S. can’t really compete with Malaysia for overall insect stunningness, but we do have some pretty good ones here! I probably spent at least half an hour mounting this specimen. Now that you have described the process, I’m surprised it only took half an hour. Great work. Also, how on earth did you get the wings spread in that life-like pose? The wings were the certainly the hardest part of this mounting job. After getting all the legs in position, I put a pin through each end of several strips of index card paper (stiff) and pinned them next to the bug, raising the paper to the level of the wings. I then used pins to pull the wings out onto the strips of paper and then used brace pins at the base of each wing to keep them spread out. This caused buckling of the wing against the pin, which would not look good if I left the pins in place, so I took additional strips of index card paper with pins through the ends and lowered the strips down on top of the wings over the underlying strips of paper to clamp the wings in place, then removed the brace pins at the bases of the wings. This is why the wings are quite flat – more than they would have been in life, but still better looking than buckles at the base of each wing. p.s. I hope you’ll also note that there is no pin through the insect body – not a result of digital removal, but because I prepared this mount without such to begin with. Lots of brace pins at different angles under the body to hold it in place!!! Shoulda noticed those spines, and guessed that you wouldn’t pick something local and common. Now this critter would be worth a visit, plus, cool ants in the location! But, I am wondering, how safe is it in those near border locations these days? I’d imagine the park proper is fairly secure. I spent time there in both 2003 and 2004 with the border patrol in post-9/11 mode – they were omni-present and quite attentive. We were there last spring (2010) and camped 5 days in the Chisos Basin campground. Went down to Santa Elena canyon and walked along the Rio Grande. Saw the singing Mexican (this is a guy who serenades the tourists from the Mexican side of the river) and left an offering in his jar. He waded across the Rio Grande periodically and emptied the jar. There were also several places where hand-made trinkets and painted walking sticks were displayed on the river bank. Each display had a note indicating that they were for sale to benefit a school across the river. We watched a man on horseback cross the river into the Park and pick up the money that had been left for the walking sticks. Never saw any border patrol until we left the Park. Sounds like the local economy has come back! Isn’t Big Bend just absolutely one of your favorite places in the world?! Ever done the Lost Mine Trail? I remember vividly hiking up to the top, standing on the highest boulder up there, and looking out across a massive canyon to Emory Peak to the west, down through the Basin and out the ‘Window’ to the northwest onto the desert 1,000 feet further down, down into Pine Canyon behind me to the east, and across the vast desert south of the Rim towards the Rio Grande and the sheer cliffs bordering the Mexican side. I also remember laying down on that boulder and looking up into the sky – I saw ravens circling far above and heard nothing but the wind. Time just sort of stood still for a while there… Man, one of those moments you never forget! We loved the Window Trail down from the campground to the slot that empties the Chisos Basin into the desert far below. The wind through the Window was ferocious that day. Another exciting place was Dagger Flat where we were surrounded by thousands of giant yuccas, all in bloom. The park is more isolated than anyplace I’ve been in the US. As we left I turned on the radio and scanned for a station. It searched the entire FM band and nothing – not even a religious broadcast. I just happened to stumble upon your blog. Very nice! I really dig how you have this girl mounted, she looks fantastic. I, too, wish she’d kept that vivid green coloration. I did keep this one alive for awhile, too. She was vicious! Thanks for stopping by and for the nice comments. Does anyone have kept this amaizing katytid in captivity? Have they breeding? We have failure with Sagoa pedo, this species run to very prolongated incubation of the eggs. I think it is common to keep adults of this species in captivity for a short period of time, but breeding and rearing from egg seems to be difficult. I captured one in Jourdanton, Tx and have it in an aquarium for the kids to watch. What should I feed it? Can it survive inside in the ac? It’s certainly a beautiful creature! I’ve not tried keeping one of these in captivity, but I expect they would do well for awhile on a diet of crickets and with a source of water (wet cotton in a dish works well). I’d love to have one of these for a pet myself.